The roll's origin is baked dougnut, the recipe is published in The Fannie Farmer Cookbook by Marion Cunningham. Although, frankly, they don't have anything in common with fried dougnuts, the texture is truly soft, probably due to the high proportion of milk in the batter. Now I still bake these rolls as coffee bread quite often especially since they are so easy to make, I even don't need any mixer but just one mixing bowl and spoon! 2 1/4 tsps dry yeast, 1/4 cup lukewarm water, 3/4 cup milk, 2 1/2 Tbps vegetable shortening, 1/4 sugar, 1 tsp salt, 1 egg, and 2 1/4 cups plan flour. In a large mixing bowl, mix flour, sugar, salt, egg, yeast water and milk mixture, stir briskly till well blended. The dough is very wet and lumpy, like cake's batter. Cover the bowl with clingwrap and rest dough for an hour or double its volume in room temperature. Spread (a big area) quite a lot of flour on the work table, pour in the dough... you need to keep dusting your hands with flour as the dough is very sticky... pat (don't knead!) it into 1/2-inch-thick big round dough. Use a 3-inch-diameter cookie cutter/water glass to cut the dough, and place them on a slightly buttered baking tray. Pre-heat the oven 450F(230C) while resting the rolls (covered) for 20 minutes. Bake the rolls 10 minutes or they JUST turn slightly brown. 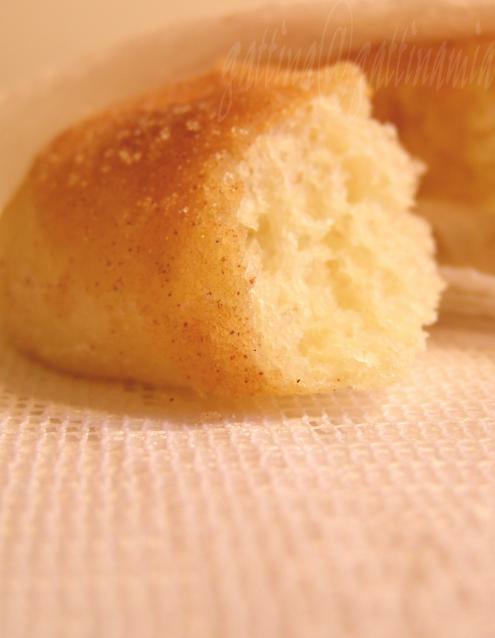 Immediately brush the melted butter on the rolls, and sprinkle with some cinnamon sugar. Served warm. Dear Folks, there are two more days to our monthly blog's event Jihva for Ingredients (JFI). Jihva means taste, desire and deep longing in Sanskrit, JFI is created by Indira at Mahanandi, and the guest host for this month is our delicious Vineela's cuisine, Vineela has chose milk and milk products as the theme for this round, please check her blog out for the details. Wow! Ready for the Jihva! !Hmmm...something very new to me...I think a lot many things in u;r blog r quite new to me!! That looks melt-in-your-mouth delicious and without any deep frying involved, yum ! At first glance, I thought these lovely rolls are deep fried. Such a pretty golden brown color, and the photo is beautiful, with the house in the background. Oh, wow! Your milk roll looks perfect! I have recommended your blog for Blog Day 2006 here. Gattina! You are so talented ... this is a must try recipe! They seem the melt-in-the-mouth variety. My kids might like this. Will surely try this. Thanks for sharing. These look the melt-in-the-mouth variety. My kids might like this. I am gonna surely try this. Thanks for sharing. Mmm--bread is on my Top Ten Foods List. That looks so yummy!!!! I can just imagine how great that smelled making them. This recipe looks simple enough for me (as a novice in baking) to digest and explore. 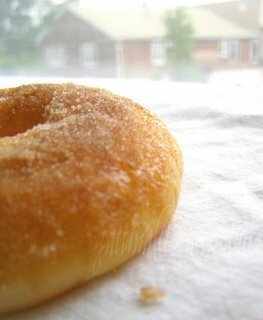 What type of cookie cutter did u use to make this doughnut shape?